Faith ... Psalms, Hymns and Spiritual Songs is a collection of familiar inspirational favorites that will captivate, refresh and lift the spirits of each listener. 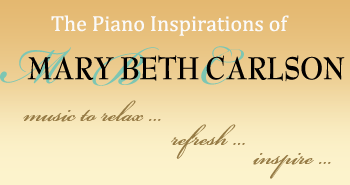 Mary Beth's impassioned piano performance which has become a signature sound throughout the country is accompanied by world class orchestration, blended together to truly inspire. Brand new arrangements include: Here I Am To Worship / In This Very Room, To God Be The Glory / My Tribute, Come Thou Fount Of Every Blessing, Turn Your Eyes Upon Jesus, For The Beauty Of The Earth / To A Wild Rose, The Lord's My Shepherd, My Jesus I Love Thee / Amazing Grace, and an original composition by Mary Beth titled I Live To Follow You.